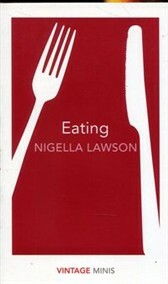 In this inspiring, witty and eminently sensible book, Nigella Lawson sets out a manifesto for how to cook (and eat) good food every day with a minimum of fuss. From basic roast chicken and pea risotto to white truffles and Turkish Delight figs, Nigella brings the joy back into the kitchen. Selected from the books How to Eat and Kitchen by Nigella Lawson. VINTAGE MINIS: GREAT MINDS. BIG IDEAS. LITTLE BOOKS. A series of short books by the world?s greatest writers on the experiences that make us human. Also in the Vintage Minis series: Drinking by John Cheever Home by Salman Rushdie; Summer by Laurie Lee; and, Liberty by Virginia Woolf.